Within the Dixie National Forest, Brian Head Peak stands at a whopping 11,306 feet making it the highest point in Iron County, Utah. From here, you can enjoy the stunning view of the surrounding valleys, alpine forests, and more. From the designated observation point at the end of Break Head Peak Road, it is possible to gaze out into three different states at once: Utah, Nevada, and Arizona. 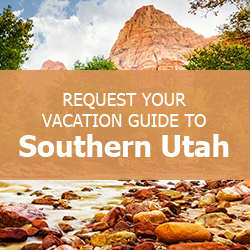 While planning your trek to Brian Head Peak, be sure to download a complimentary copy of our Southern Utah Vacation Guide! Filled with essential information on the area, this handy planner has local recommendations and insight into the best things to do during your stay. Find out more about hiking trails, nearby national parks, and local restaurants. Countless travelers have used this tool to plan the perfect vacation. Get your copy today! To get to Brian Head Peak, you’ll follow directions to the Dixie National Forest and get on Brian Head Peak Road. Follow this route until you reach a turn-off near UT-143 past the road’s intersection with UT-148. Along the way, you can stop to enjoy the view from the North View Overlook at Cedar Breaks before continuing to the Brian Head Peak Observation Point following the sign for “Vista Point: Brian Head Peak.” The gravel road leads visitors around the mountain’s edge for 2.7 miles before reaching the top. The view from Brian Head Peak is truly unbeatable, but the drive up can be tricky for inexperienced drivers. It’s important to have tires with good traction as the road winds around the mountain and becomes very steep in certain sections. If you’re unsure about driving the entire way, or you’d just like to wander the area, you can pull off the road and park at the Marathon Trail before hiking the remaining 0.8 miles to the top. Once you’ve reached Brian Head Peak, you’ll be stunned at the 360-degree views of Utah, Nevada, and Arizona. Below, you’ll see wildlife grazing in the forest, and in the distance, you’ll notice other red-hued mountains extending for miles. Pack a picnic and enjoy lunch with a view inside the open-air stone structure at the top. When you choose to stay in one of our Family Time Vacation Rentals, you’ll have all the comforts of home while remaining close to Southern Utah’s best attractions like Brian Head Peak, Bryce Canyon National Park, and Cedar Breaks National Monument. Whether you’re traveling with a large group or as a small family, we have the perfect accommodations for parties of all sizes. This Ridge Top Lodge is located in Brian Head, UT, and large enough for up to 20 guests with seven bedrooms plus a loft and game room. When you stay at this gorgeous mountain cabin, you’ll be near dozens of biking, hiking, and snowmobiling trails as well as national parks and other attractions. In the evenings, relax with family and friends around the fireplace in the living room or have a game night in the entertainment room.